Posture magazine Issue 4 2017. In today’s world of hyper-connectivity, the new status of instantaneous celebrity has never been so coveted or easy to achieve. It’s a new age phenomenon and no one parodies it better than the living, breathing latex-clad conceptual work of art known as Pandemonia. 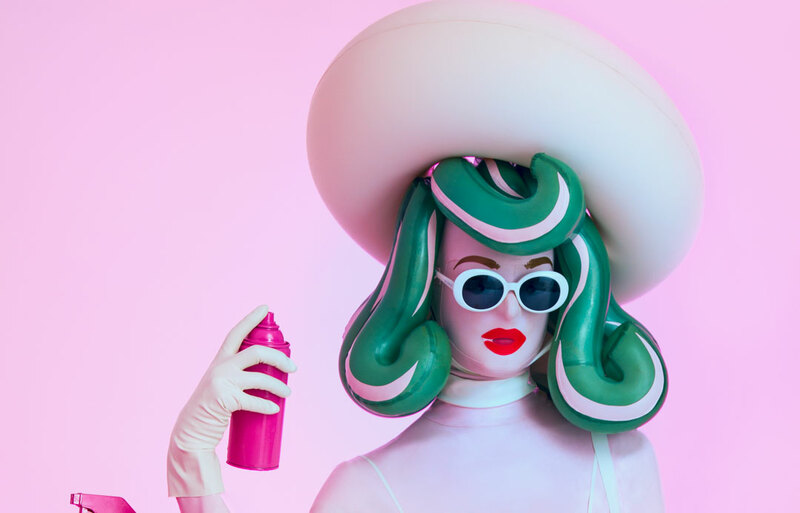 By creating a plastic, inflatable character, the anonymous artist behind Pandemonia manifested a truly artificial celebrity that has finally achieved what all insta- celebs crave: an immutable sense of fame, youth,and allure. I’m a London-based artist and designer. My inspirations stem from the idea of beauty and the use of the female form throughout history. I’m also interested in philosophical questions about who we are and how technology is changing our sense of self. Identity is so important to Posture’s audience and is embedded in queer culture in general. The artist behind Pandemonia is known to conceal their identity and it has left many intrigued. I have to ask, why the secrecy? The secrecy presents Pandemonia as a blank canvas; the public can project their own stories onto her. The intrigue enhances. When the answers are not readily available, we are encouraged to think for ourselves. During our shoot, you mentioned that all of your looks are handmade. How long does it take to make a full look and what goes into it? Yes, It’s quite labor intensive. A head takes about a month to create. I think it’s important that it is created by the artist. Plus, I love the process. I start with drawings and plasticine maquettes, eventually working up to a pattern and then the finished piece. Ironically it looks easy and mass produced which is so Pop! You also mentioned the delicacy of the latex that you wear. What kind of care goes into these outfits? How long does each creation last? They’re all so genius — how can they be eternally saved? Thank you, I’m glad you like them! Yes, they are extremely fragile. They all need to be polished and stored carefully in the dark. At present I still own nearly everything I’ve made, over 70 dresses. All my work starts as a 2D pattern. I carefully archive all the patterns so they could, in theory, be infinitely reproduced. Many artists create work that lives on the walls of galleries, but you were brought to life and into the everyday lives of others. We’ve seen you at work events, fashion shows, industry parties, etc. What makes Pandemonia so different from the muses that are simply painted on canvas? for very specific reasons and I think it’s important for Pandemonia to be seen at these venues. you make that saying way more literal and way less cliché because you’re sealed in latex no matter the circumstance. How do you handle it? On the surface Pandemonia is glossy and forever young, but under that veneer is a very physical experience. Con fronting these impossible ideals is an analogy for the illusions we are faced with day to day. With the recent release of documentaries on female masking, interest in this particular subculture is on the rise. When it comes to conversation on the topic and how you fit in, opinions are always torn. Though the similarities are evident, there’s just something so different (and highly conceptualized) about Pandemonia. How do you relate to and differ from this subculture? Is there any advice you can give to young pop artists and designers who want to be like you and look up to you? Gosh that is a hard question. I would say, inspirations are so personal, and what you want to do might not even have a name yet. Follow your instincts and avoid mainstream categorization that will only stymie your process. artist, creative director, and fashion designer. Knowing what you’re capable of, what can we expect from you in the near future? Closer to the idea of art outside of the gallery, fashion has become a natural step for me. I love the idea of creating statements that people can wear and interact with. I have been designing a collection of accessories that I hope to launch by the end of the year! Also, I’m collaborating with a handbag company to design a Pandemonia collection. It’s super exciting. It should be out next year, I’ll keep you posted! This entry was posted in Articles, Photo shoots and tagged celebrity, conceptual, Douglas Cornwall, Gary Freeman, inflatable, inflatable art, Inflatable hair, Kyle Stuart, latex, Mischa G, Morgan T Stuart, Post Pop, Posture, Posture magazine.